Enjoy the classic Greek treat in its vanilla edition! 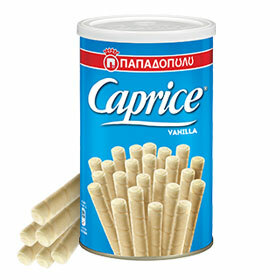 A world known favorite, Caprice makes a great snack, a great gift, or an iced special treat(freeze it and enjoy cold). Made in Greece by Papadopoulou S.A. Bisquit and Foodware Industries.